This life-size, left-facing, full-length, standing ¾ profile portrait depicts the 53-year-old Captain John Piper in a commanding pose. Its landscape setting is immediately identifiable as the eastern foreshore of Sydney Harbour, with a distant view to Henrietta Villa, Piper’s recently-completed prestigious waterfront home at Point Piper, forming an appropriate backdrop. Piper is shown in a civil uniform of his own design, thought to have had custom-made for him in London by a leading tailor. As befits the owner’s position and bearing, this outfit is cut along naval lines and made-up in a dark blue woollen cloth, the double-breasted jacket with standing collar and gold epaulettes at the shoulder, fastening with two rows of large brass buttons, worn over a fine white linen shirt with a peaked collar, slim-fitting trousers and fine leather shoes, or boots, with an ornamental gilt dress sword slung from the left hip, and holds a black top hat in his left hand. A gold watch and chain, set with pendant fobs, is also visible hanging down below the cropped front edge of his jacket at the waist. Following a long and successful career as a colonial administrator, Captain John Piper (1773-1851) was appointed chief customs officer for Sydney in 1814; in lieu of a salary he received 5% of all monies collected. At the peak of his service he was receiving thousands of pounds a year. As one of the wealthiest individuals in Sydney, Piper could now afford to indulge in the level of living he had always wished for and a home worthy of his newly-acquired eminence. In 1818 Governor Macquarie granted Piper 190 acres [77 hectares] of land to be known as Point Piper. Henrietta Villa, built between 1816 and 1822, was completed at a cost of at a cost of £10,000 and considered to be the most elegant house in Sydney at the time. Piper’s star was only in the ascendancy for a few short years. 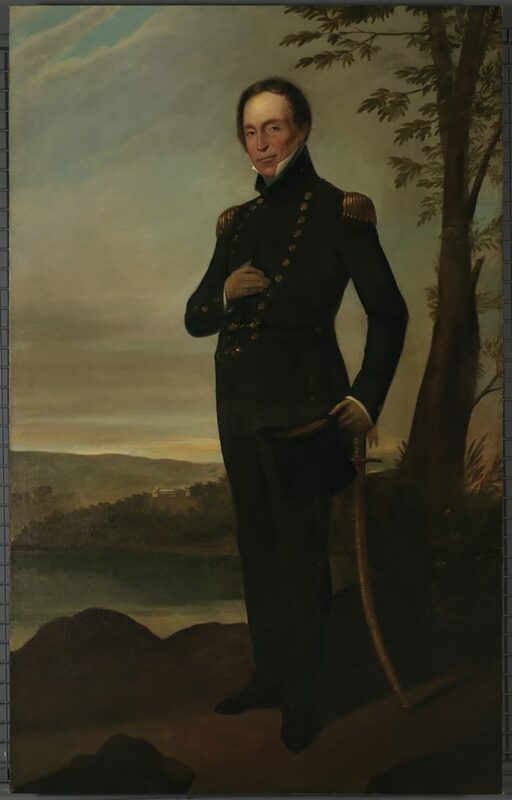 He proved lax in his duties as naval officer, and was suspended from his position by Governor Darling, who demanded the customs deficiency be made good, and Piper was forced to auction off his property and belongings in May 1826.